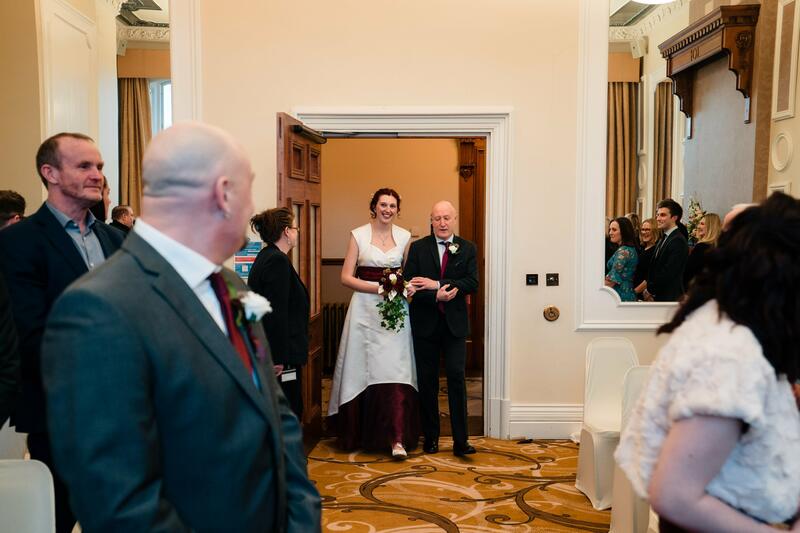 Last weekend saw the wedding of Lexi and Gary at Huddersfield Registry Office. This space is beautiful. Located in the grandeur of the Victorian Huddersfield Town Hall, West Yorkshire. Their ceremony was fantastic for photographing in. A venue with light, glory and high ceilings. It was also Stories Of I Do’s first time for wedding photography in the Huddersfield area! 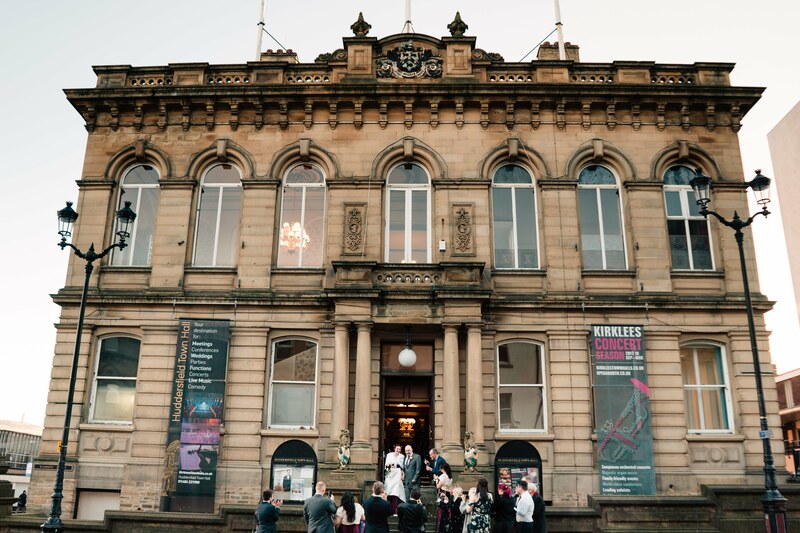 It was an amazing experience to be part of a wedding at Huddersfield Registry Office. Lexi and Gary’s wedding was never going to be a quiet wedding. 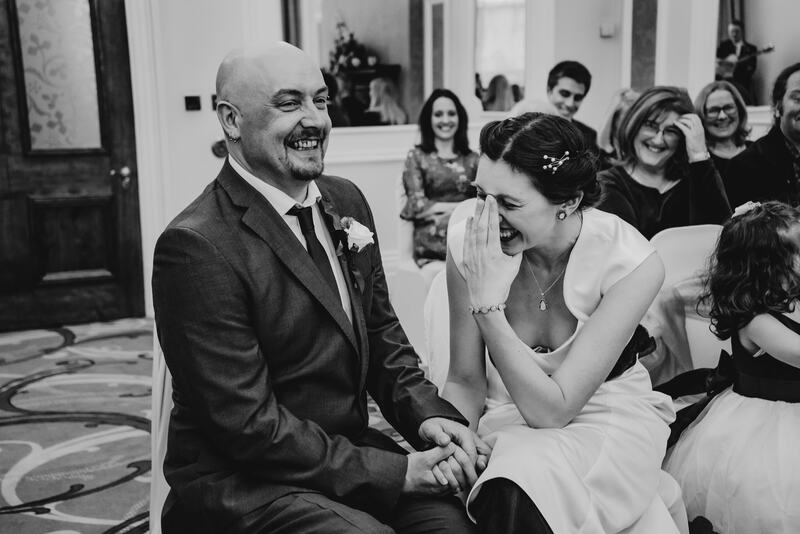 Their wedding of laughter, colour, love and vibrancy certainly didn’t disappoint. The day started at Lexi’s mum’s house in the morning for bridal prep. It always surprises us how calm it is. It is not at all how we would have imagined it before we became wedding photographers! Lexi arrived at the ceremony via Aston Martin. After a short service, we took some time for a few couple portraits. 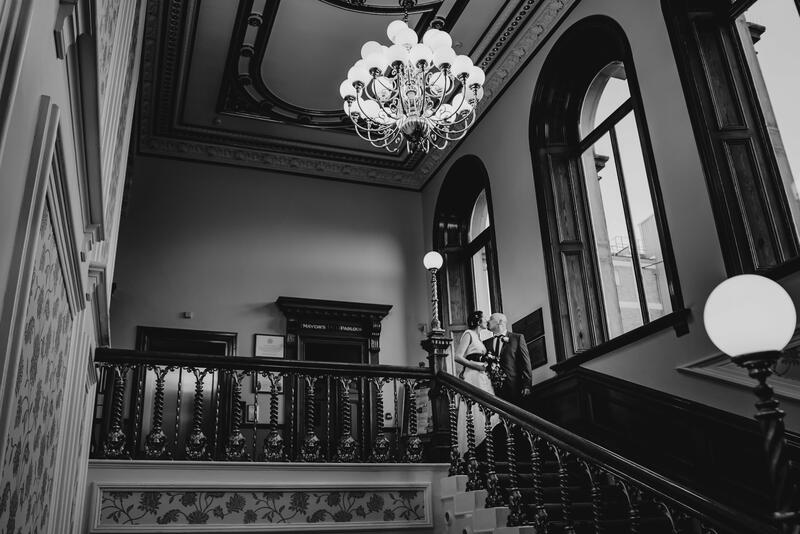 Accompanying them on the magnificent Huddersfield town hall staircase for some dramatic shots. Later heading out of the registry office with the wedding party for the bubble confetti. We spent the rest of the day at The Keys in Huddersfield. A fantastic restaurant and cafe among the stone vaults of the parish church! An amazing crypt venue with atmospheric arches. After the ceremony, there were many of opportunities to capture those candid moments. Capturing moments between Lexi, Gary and their family and friends. Even though it was February, the sun even made an appearance too! After some delicious sandwiches and some great speeches, it was time for the night do to kick off. 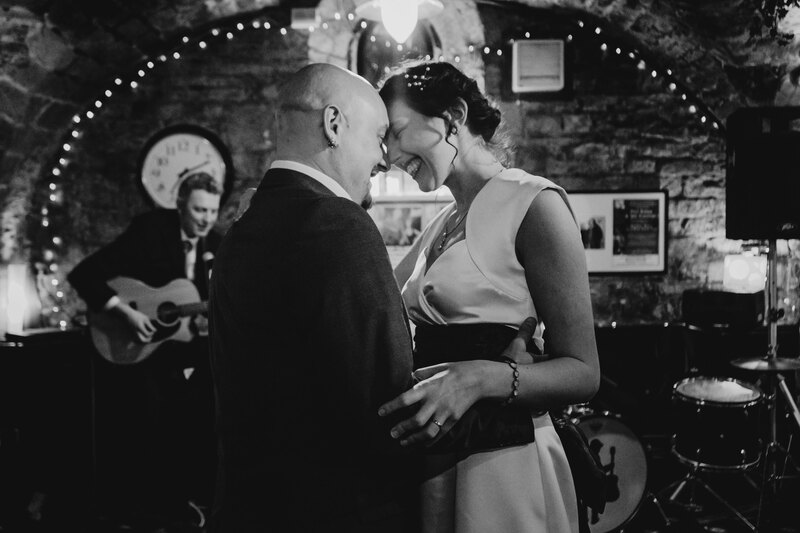 An incredible band, singing and dancing, this wedding had it all. Congratulations to you both, such a happy day. A great day and a great couple! All the best Lexi and Gary! Here is a selection of our favourite photographs from the day. R + J | Temple Newsam House Wedding Photography STORIES OF "I DO" Sneak Peek – Elizabeth & Scott | Elslack, Skipton Wedding STORIES OF "I DO" Media City Manchester Wedding – Rachael & Stuart STORIES OF "I DO"